Different styles of Federal Jackets we offer. 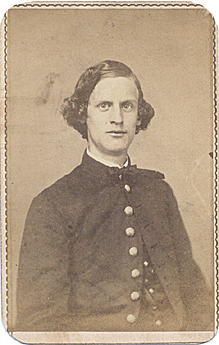 In a general orders Dated January 20, 1854 states " A Uniform Jacket of Dark Blue as dress and fatigue wear for all mounted branches of the army." Mounted Services Jackets have a 6 piece body, 2 piece sleeve and a tall standing collar with a 12 button front. 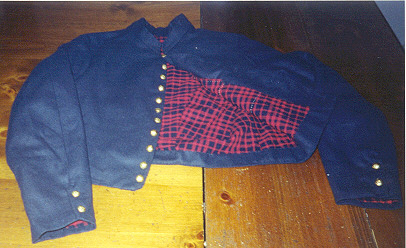 Materials used for these coats was a fine woven Dark Blue Broad cloth with lining varying per jacket. While the General orders call for a white flannel lining (Domet) some originals have been noted to have linings of Grey jean wool, and various cottons. Each jacket is trimmed with the appropriate branch of service tape, Red for Artillery and Yellow For Calvary. 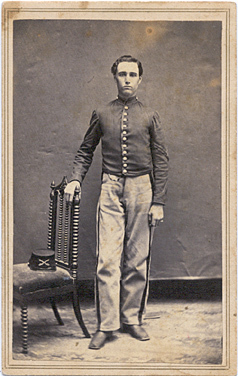 The Jacket I produce is a Schuylkill Arsenal Mounted Services Jacket, The Schuylkill Arsenal was a prolific government supplier for the federal army at which most garments were completely handsewn. My Jackets have all the visible stitching handsewn, with the main (Invisible) seams machine sewn. 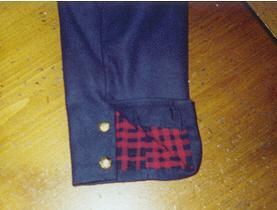 While this jacket was mostly issued to mounted branches, there is evidence of the jackets use by Infantry men with the trim removed. - Schuylkill Arsenal infantry jackets, This Shell Jacket sometimes mistakenly referred to as a "signal corps jacket" is a very versatile garment good in any theater and for officer impressions. The Jacket features a 2 button functional cuff and 11 button front. The jacket is made from wool broadcloth as per original examples, and lined with cotton shirting per some originals that exist. The jacket has all visible stitching handsewn w/ logwood dyed thread and stamped with the correct SA and size stamp. Sizes 40-46, size 46 add $10 to the price. - Schuylkill Arsenal Mounted Services jacket, This is the common jacket of the Calvary and Artillery Branches and trimmed in the appropriate branch of Service colors. The Jacket features a 12 button front and a functional cuff with 2 buttons. These jackets are made from wool broadcloth and lined with your choice of jean wool or domet flannel (both seen in surviving originals). 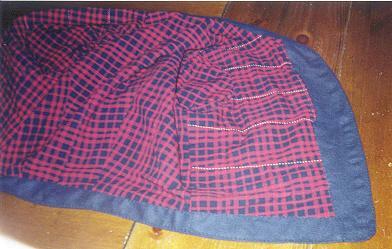 All visible Stitching is handsewn w/ logwood dyed thread and tape trim is applied by hand. Stamped with correct SA and Sizes Stamps. Copied from an original in the West Point Museum. This coat features functional epaulets and is corded in a French blue cording (not piped like some frocks or jackets) machine sewn and handsewn per originals. half lined in brown polished cotton and has an 8 button front complete with correct NYS buttons.